Hello from somewhere in the Beaufort Sea! It’s our 4th day aboard the Norseman II and data collection has been going smoothly. The ship’s crew is knowledgeable, friendly and helpful – if we need something done they seem to know exactly how to do it. The scientists have adjusted to our work shifts and sleeping schedules, and we are starting to get into a routine with data logging and monitoring the equipment. And I should also mention, the food on this ship is fantastic (shoutout to the cooks: Marlin and Daron). So here we are! Out in the Arctic collecting heat flow and chirp data. Are you wondering what we’re doing this for and how it all works? I’ll try to explain. Rob Harris and the ships Bowson, Jim, deploying the heat flow probe at our very first site. 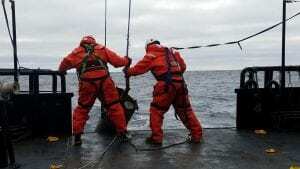 Any time we’re out on the deck working we have to have on these big orange mustang suits to keep us warm in the freezing temperatures when very cold water is often splashing up onto the deck. The Norseman II is currently steaming along a North-South transect across the North Slope of Alaska as we plunge the heat flow probe 3 meters down into the ocean-bottom sediments at a ~1 kilometer spacing. One deployment takes about one hour, because once the heat flow probe has landed in the sediments, you wait about 15 minutes for the probe to take measurements, plus the extra time spent ensuring the probe is oriented the right way before you drop it down. 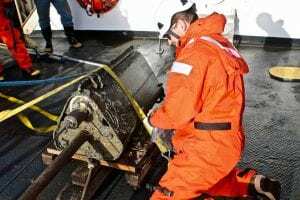 This operation is mainly done via cable on the ship’s winch, and it also takes a fair amount of time to reel out and reel in cable to raise and lower the probe. Our first transect has 34 heat flow probe deployment sites, and we are almost done with this first line with only 4 deployments left to go. Then, we will move on to another transect further to the West and do it all over again. 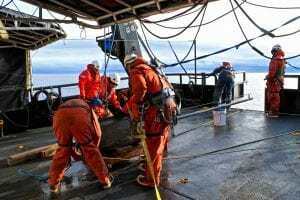 The depth of the seafloor along our transects is about 1500 m starting on the deep side of the slope, and comes up to about 200 m just across the edge of the continental shelf. By the time we finish up here in the Arctic we will have completed several hundred heat flow deployments along 5-7 transects between Prudhoe Bay and Wainwright, Alaska. Ben Phrampus and Matt Hornbach on the deck in mustang suits before pulling the heat flow probe back onto the boat. Crew and scientists getting the heat flow probe secured on deck between deployments. The heat flow probe data tells us about temperature, conductivity, how heat flows through the ocean bottom sediments, and can provide us with sediment samples. 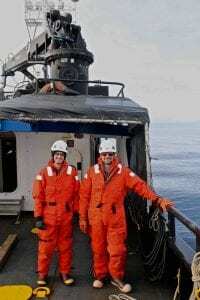 This data allows us to better understand how the Arctic Ocean formed, because oceanic crust cools as it moves away from the crust-forming margin. It also gives us information about gas methane hydrates, which can destabilize at depths of 200-300 m due to ocean temperature warming and this can cause slope failure events and tsunamis. Matt Hornbach taking a mud sample for conductivity measurements. In between each heat flow deployment site, we collect chirp seismic data to profile the top 10-20 m of ocean bottom sediments. This has been my favorite part! I think it’s the coolest thing ever when you can see stratigraphy way down below the surface of the Earth. In the chirp data we are looking for any signs of deformation, slope failure, fluid flow, faults, and other features of interest that might produce anomalies in the heat flow data. A chirp profile taken at about 400 m ocean depth. 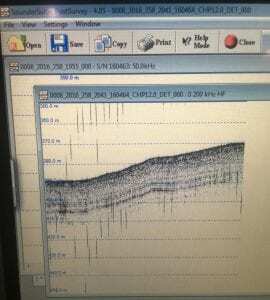 You can see some really well defined stratigraphy in the top 20 m of sediment! We also use the chirp in “Pinger Mode”, or listening mode. As the heat flow probe travels through the water column it lets out different pings that tell us about the orientation of the probe and state of the thermistors, and in listening mode we are able to keep track of the heat flow probe as it stays deep underwater for hours at a time. Ben Phrampus and Rob Harris watching the chirp in Pinger Mode and keeping track of the heat flow probe during one of the deployments. That bathymetry map above them on the wall shows several white lines up and down the North Slope – these are some of the transects we’re going to be collecting heat flow data along. The data are looking really good and I think everyone on board would agree that it’s a privilege to be out here studying a part of the world where very few people ever get to go. We’re collecting data that will be used for a long time by many scientists in the future, so everyone has been extremely involved, working together and coming up with quick solutions to the unavoidable setbacks that are a normal part of a project like this. Our 10 science days (+2 steam days) on the boat will be up before we know it (HOW has it already been 4 days!?!?) so we are working every hour to make sure we are collecting as much quality data as physically possible. I’m enjoying life at sea more than I thought I would…considering dropping out of grad school to become a pirate. I’m glad to see that all have acquired their sea legs, as the Beaufort can be a bit wild this time of year. Keep up the good work. I can’t say that I really miss working at sea, but there is a bit of envy on my part. Keep up the great work! What a cool science project. Great post! Thank you very much for sharing your information with us ! keep it up !